Much has happened, all terrific. Long post here, but for the visually inclined some pictures are embedded and there are several related galleries up for perusal. Early one morning I was enjoying a cup of coffee with Leonie in Stephanie’s kitchen, surrounded by the hundreds upon hundreds of peaches that we had been alternately eating, canning, freezing, dehydrating, and even pulping into very tasty margaritas, when we heard Sylvie yelping like a treed cat from somewhere in the front yard. The peaches were a result of an afternoon spent gleaning an orchard an hour or so away. Even after the pickers had moved through, dozens of peaches lay on the ground surrounding the trees like furry little land mines, orange and yellow and ripe, knocked loose and left behind, and we walked between the rows with the girls and filled over a dozen bins in an afternoon. 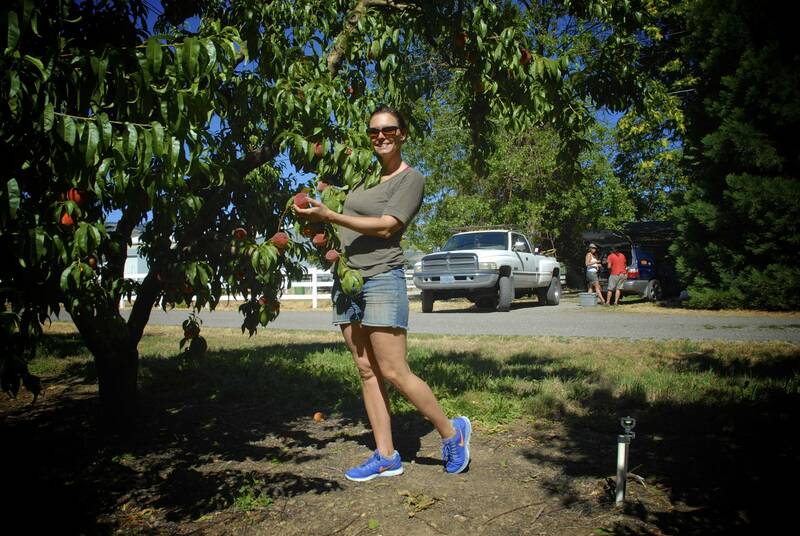 Here we see the lovely Valerie, contemplating the bounty that awaits us in the peach orchard, while Feral, Stephanie, and the big old Dodge lurk in the background. We had collected so many peaches that we came to refer to our situation as “peachmageddon”. The yelping pulled our attention from the peaches. Leonie and I ran outside to find Sylvie climbing out of the outhouse window, dangling six feet above the ground, wide-eyed and caterwauling and completely surrounded by a gaggle of six turkey chicks on the ground below her, each staring up at her expectantly and peeping away. 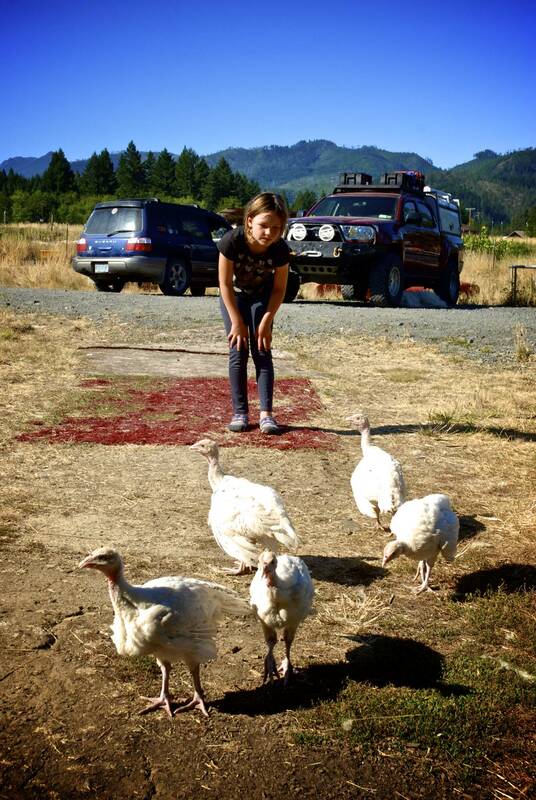 I jogged over to her and the turkeys, recognizing me, broke ranks and crowded around my feet instead, inspecting my toes and the nearby grass for seeds, or bugs, or whatever else it is that they have been programmed to eat. Sylvie crawled the rest of the way out the window and dropped to the ground, and kept a wary eye on them. With that, she ran to the house, giving the turkeys a wide berth, on her way to forage for breakfast. Which, given sheer numbers combined with her fruit predilection, would almost certainly be peaches. Just yesterday the turkey chicks, which are not really chicks but juveniles, maybe as big as hens, came out of their coop for the first time in their lives. By complete coincidence I was standing there as they hopped out into the yard, blinking their eyes at the direct sun, seeing it and the sky and clouds and mountains and trees for the first time, and I watched the six of them enjoying what was effectively a second birth – first the world outside the egg, now the actual outside world. Their feathers were all still completely white, and they stretched their wings, huddled together as a group, looked around and, seeing me, and having had only humans to associate with shelter and food and warmth and safety thus far, immediately crowded around my feet and began to doggedly follow me wherever I went. They followed me to the truck when I went to get some tools, they marched after me when I went to hang some towels to dry, they huddled around the gate when I disappeared for a couple hours to help move some earth and gravel for the local school. They got themselves tangled in fences, trapped in boxes, stuck in open car trunks, snared in blackberry fronds, and tried to nest in the glorious thick fur of Badger, the enormous white Pyreneese that guards the farm (Sylvie genuinely thought he was a polar bear at first) who took a good sniff of the color-matched chicks and thought about them for a moment as they hopefully crowded around his paws, peeping away. He fled, and the chicks returned to making a series of generally clumsy choices about interacting with their new world but it was oddly endearing and I figured that I’d certainly have to cut them a break. I mean, how well would I do if, having been raised in a closet, someone had set me loose in Brooklyn a few hours following my 12th birthday? Aaand… the chicks. Five of the six pictured here, the other one I am sure is following me around and trying to get into the shower with me. Over the course of the day I kept half an eye on them, freeing them from the various perils they brought upon themselves, and at one point in the afternoon left to go for a run. The weather has been scorching here in the Illinois River Valley, easily north of 100 degrees by noon, and there isn’t much natural shade in the valley. 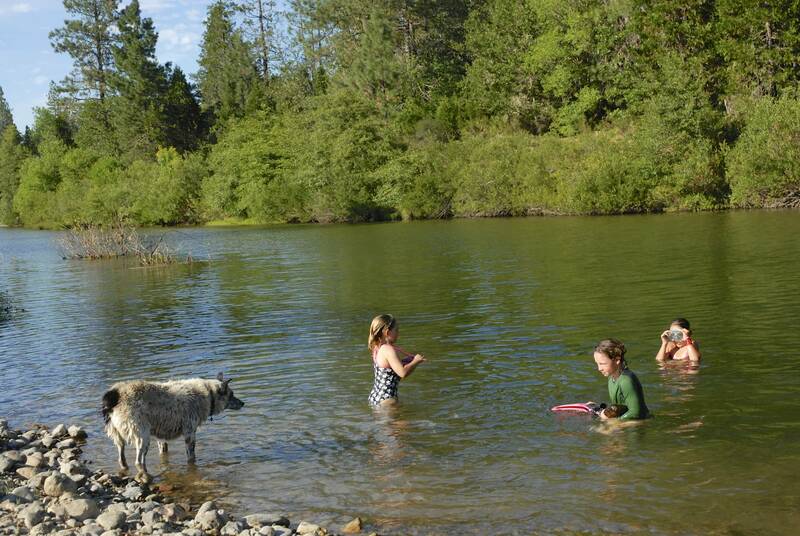 There is, however, a swimming hole with cold, pristine water roughly five miles down the road from the farm, tucked beneath a modest concrete bridge on a gravel service road. I’ve been running hard to the bridge for the past few days, and the moment I get there I kick off my shoes and leap into the water and revel in the shock of going from vastly overheated to hypothermic in a heartbeat. Five minutes of floating is just enough to cool me to the core, at which point I’ll climb out, lace my shoes back up, and hustle back to the farm where no such pool awaits. 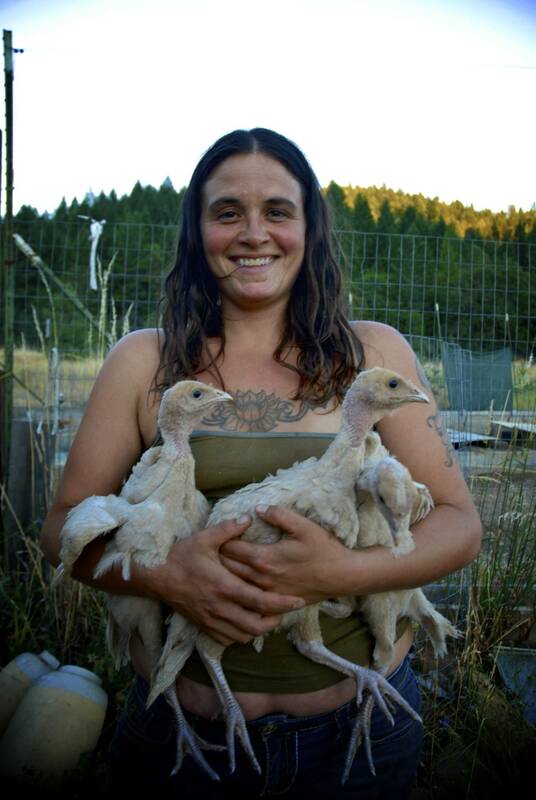 This day I came back, panting, the turkey chicks scrambled to my feet as I hid in the shade of a tree and collected my breath, my wits, and poured water into my body. After ten or fifteen minutes, I decided to cool off in the outdoor shower rigged up at the side of the house, and so got the water running, pulled off my clothes, and hopped in. And so did the turkey chicks. All six of them. I would nudge one out of the stall with my foot, and another would flap in. I picked them up and placed them outside, and they would take a moment to regroup, and crowd back. Val was in the house, so I called out to her, hoping she would be able to help. When she got a look at what was happening, she ran back into the house to get the camera and snapped a few pictures of me, clumsily trying to shower with the six chicks. Six chicks, and me, naked, showering together. With Val snapping photos, I grabbed an empty bottle for the sake of modesty. Not sure what else to say, here, other than it’s every bit as awkward as it looks. “Just think about how many hits the website will get if you get the words “naked chicks” in the title” she said. 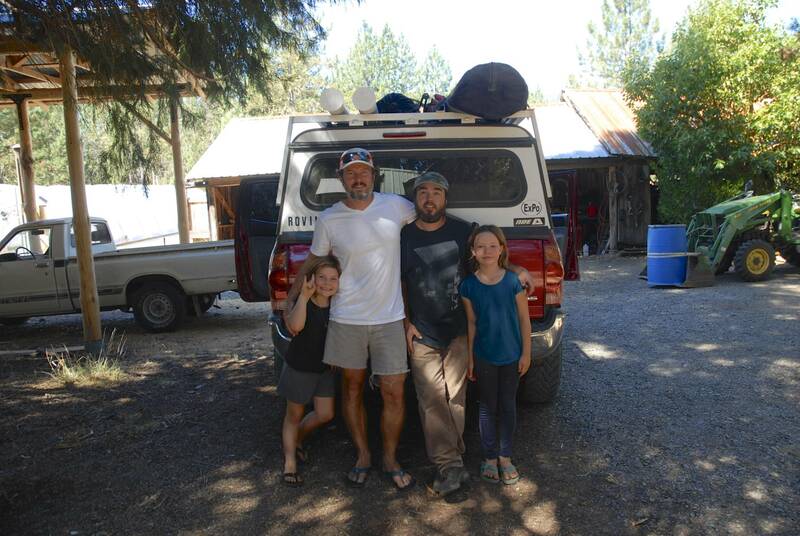 Or perhaps more accurately, we have been homesteading with the close friends we made on our trip down the Baja, Stephanie and her daughter Abbie, and Feral. We pitched our tent on some more or less common ground between several farms here in a community that is conjoined by dozens of trails between the fences, and have fallen into a lifestyle that is as remote as one could possibly imagine from our Brooklyn lives. They have land here, and they have built homes and planted the fields and built irrigation systems and sheds and coops and fences. There is always something to build or fix or grow or nurse back to health. There is also always something to learn and their lives are constant experiments – how to make the soil more productive, which plants will compliment each other, the best way to preserve fruits or heat water or cool the house or dry onions. Then there are the tests that the land itself presents them with no warning. The first morning we were there, while Stephanie was enjoying her tea and I was working on some breakfast for the kids, we got a phone call from the neighbors because a rattlesnake had become trapped in some netting in their garden, and they were hoping to free it. I followed Stephanie to her neighbors, Sarah and Jeff, and the girls followed me and while they took the time to inspect some ducklings that had hatched just a day prior we stood around a young rattlesnake that Sarah wanted to try to free but had regrettably fatally entangled itself. 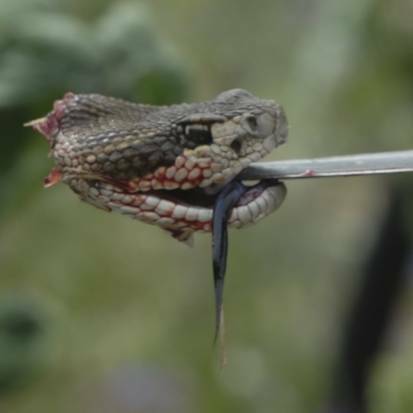 The problem with a rattlesnake is that, despite our relative familiarity with them and our desire to set it free, a bite would require a fraught trip to the hospital at Grant’s Pass, the closest place with anti-venom, easily an hour away and a trip that nobody was willing to risk having to make. After a few abortive attempts to cut it free, it was clear that we didn’t have a realistic choice other than killing the snake. And so, before even being able to have her breakfast, Stephanie found herself gamely, regretfully, trying to hold a rattlesnake still in order to put it down. It is beautiful here, and there are bounties available that require only hard work, patience, and a little luck from mother nature. Gardens provide tomatoes, corn, kale, blackberries, blueberries, lettuces, eggplants, cucumbers, beans, peppers, zucchinis, herbs, onions, garlic, just about everything we could imagine wanting to eat. But the bounties deliver themselves in waves, presenting themselves for consumption all at once, and so we found ourselves getting a crash course in preserving, canning, smoking, and drying. And there’s also a lot of gorgeous, fresh garlic. Oh and also wild crabapples. We would spend mornings gathering, and afternoons cleaning, preparing, chopping, and monitoring huge pots on the outdoor stoves that boiled away with their inventories of relish, pickles, sauces, and, in a completely spectacular instance, mussels. Stephanie announced, several days into our tenure, that she needed a break from the hot and dry climate of the farm and put several buckets into the back of her car. We left early the next morning in our truck, following Stephanie the sixty or so miles to the coast where we parked our vehicles and navigated the steep beach down to the Pacific. There, with the tide out and shrouded by a cool grey blanket of fog, we scrambled over several rock bridges and located huge, incredibly rich beds of mussels that the retreating tide had revealed to us. 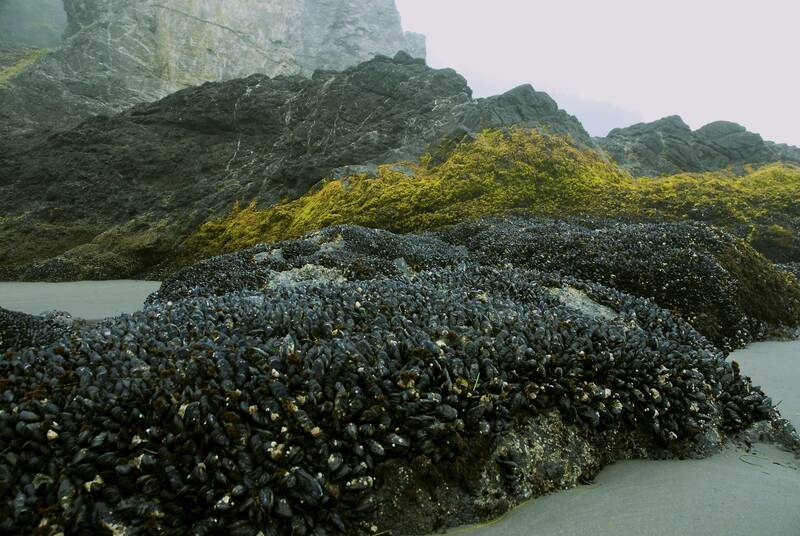 Mindful of the permissible amounts we could take, we filled the buckets with handfuls of mussels that we pried from the rocks and then enjoyed a picnic lunch in the glorious, cool fog that eddied about a cove guarded by steep rocky cliffs. The girls played with the dogs and each other while we munched on dried peaches and smoked salmon and bread, and when we were done we packed the mussels in ice and made our way back to the farm. For dinner that night we had a meal that would have been the envy of any French chef, a linguine studded with dozens of freshly steamed mussels, coated in cream and butter and chopped garlic and white wine and dotted with vibrant green herbs, and at one point Stephanie put down her fork and announced, simply, “poor us”. She was at once being both perfectly ironic, and perfectly accurate. Most of the folks around here, when their lives are measured against their tax returns, are living below the poverty line. But they have built for themselves, over the years, a vibrant and connected community, a school, and through hard work have provided more and better food for their families than is possible to imagine until you’re sitting at a dinner table, awash in it. And we were hardly done with the mussels. The next day, I spent the entirety of the morning sorting, cleaning and then steaming the mussels (maybe three hundred of them, some the size of small footballs). Then, we brined them and prepared a wood fire of madrone and I cut thick discs of green applewood that Stephanie had harvested from a century-old apple tree on the border of one of the properties. 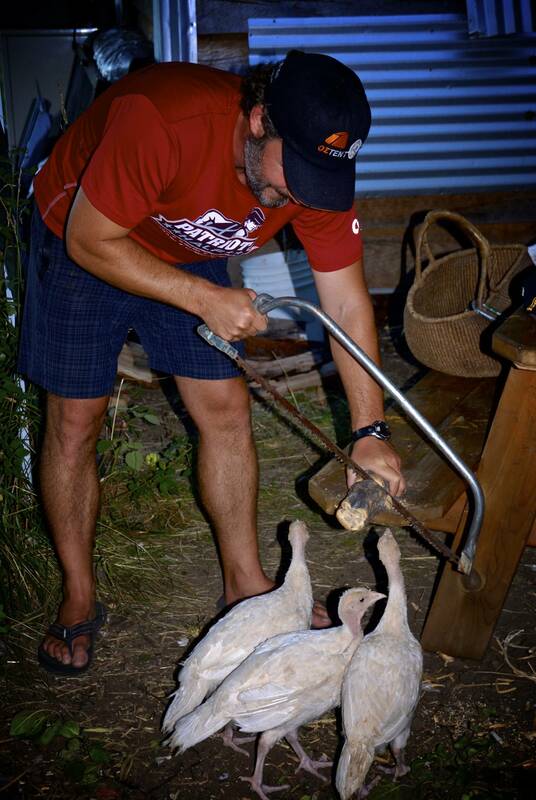 Again with the turkeys… everything I try to do on the farm is complicated by their enthusiastic participation. In this case, I am cutting discs of applewood. 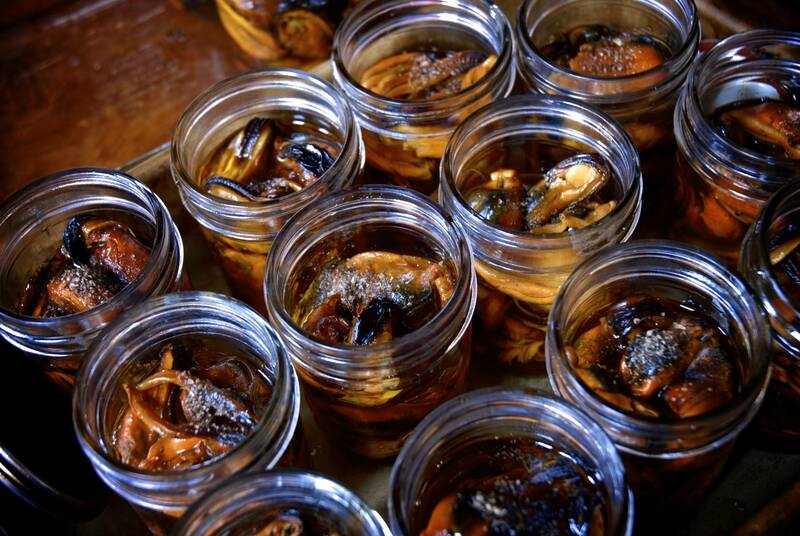 I lay the applewood on the hot madrone coals and smoked the mussels in batches of a hundred for half an hour or so, and then we placed them in jars, and filled the jars with olive oil and topped them each a pinch of smoked sea salt. We pressure canned them, and in order to put our efforts to the test, we made a meal of smoked mussel reubens: grilled sourdough, gruyere cheese, homemade saurkraut, a layer of roughly chopped smoked mussels, and rounds of breaded and baked eggplant, all of which was subsequently topped with a thousand island dressing that Feral constructed while we worked on the sandwiches. The result was indescribably good, and the dinner table that night, comprised of four adults and as many kids, was stunned into silence for the duration of the meal. As she finished her sandwich, and washed the last bite down with a mouthful of white that Val and I contributed to the feast, Stephanie caught her breath and announced, very accurately, “poor us”. The girls have been thriving. They wake in the morning and make their rounds, saying hello to the dogs, and then the chickens (checking to see if any eggs are waiting for them in the coop), and the turkey chicks, and then they will harvest greens to take to the rabbits, and finally they’ll enjoy breakfast before running back outside. They may then jump on the trampoline, or harvest whatever is ready in the garden, and drop by the house to eat peaches and drink water and then return to the outdoors in order to practice dangling from the monkey bars or visiting the flower gardens or lobbying us aggressively for a visit to any one of a dozen swimming holes nearby. Abbie teaches the girls how to use her stilts. A little late afternoon acrobatic display as Sylvie leaps over Leonie. Sylvie and Arabella at the swimming hole with their… um… new hats. We’ll pack food, and some drinks, and bring towels and chairs down to the river’s banks and let the Illinois carry all of the accumulated heat of the day away and when it has, wander back home. We’ll make dinner – kale sautéed in fresh garlic, or huge salads, or head over to Feral’s farm in order to enjoy his fresh baked pitas stuffed with falafel and dripping with tahini and spilling over with cucumbers and basil, and we’ll drink cold beer and talk and enjoy the cool air that the setting sun has allowed to fill the valley, and we’ll all think to ourselves, “poor us”. There is constant traffic through Stephanie’s house, the doors of which are always open, in which we play only a small part. In the typical hour or so during the morning when I am in, making coffee and breakfast for myself, my girls will come racing in to grab a ripe peach and disappear outside in order to locate and feed Batman and Caramel, their favorite rabbits. Other girls from the community will intermittently poke their heads inside, looking to determine where Abbie is in order to play, and I will press peaches into their hands before they leave. Sarah, a woman who is living in a modest cabin in the corner of Stephanie’s property, may stop in with her radiant smile and enormous mane of jet black dreadlocks, in order to offer her assistance in pruning a crop. One night we found out that Sarah, originally from New Jersey, had decided to see the country so rode her bike across it. Twice. Sylvie, whose ridiculous tangle of golden hair makes her essentially the visual antiSarah, found herself rapt by Sarah’s dreadlocks and announced over breakfast to Val and myself one day that she wanted to have dreadlocks too. Perhaps Sharon and Egret, artists who live in a converted school bus on another spot on the property, will stop by and compare notes on what vegetables need to be harvested, or to get help with their costumes because it is Taco Tuesday, the weekly local cookout and talent show attended by eighty or so people. The girls went to Taco Tuesday and, incredibly, Leonie got up on stage and broke out a few of her trusted knock knock jokes, which I thought was a singular act of courage for an eight year old in front of a big crowd of largely unknown people. Sylvie, mesmerized by both the band and Sarah decided to stay on after the show to dance and gathered the nerve to ask Sarah to be the adult who stayed with her and subsequently walked her home at midnight, still singing. Or Jeff, who is married to an other Sarah (rattlesnake Sarah) will drop in to begin work on a packing list for a camping trip he is planning for a handful of the older kids in the community. Following Jeff will be Rosie, his two year old daughter, and my girls will pounce on Rosie and take her jumping on the trampoline or hunting for chicken eggs. Amy, whom Stephanie is essentially apprenticing to grow certain crops, will come by the house with her daughter, Arabella, and the girls will rope her into their games. Before I can finish my coffee, on any given morning, at least a dozen people will pass through the kitchen. It is about the most interactional cup of coffee available in the whole of Oregon. Somehow, two weeks completely disappeared on us. 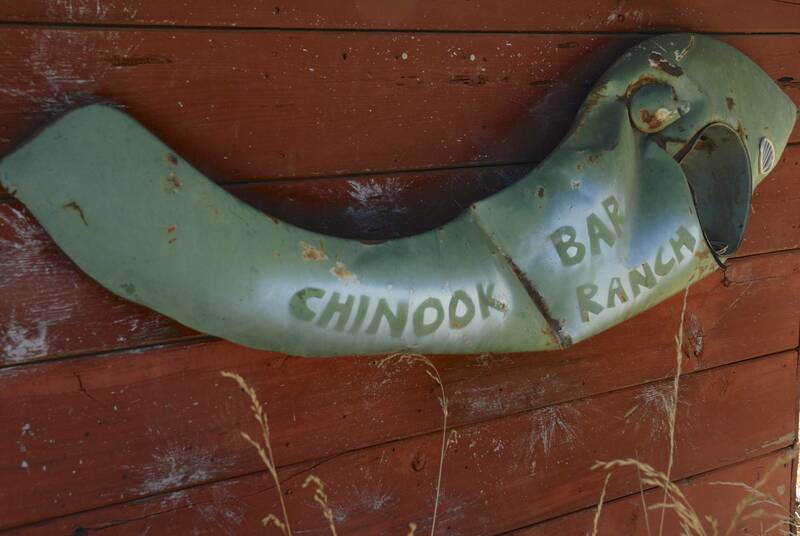 We moved from Stephanie’s farm to Feral’s farm, Chinook Bar Ranch as it is known locally, as Stephanie was leading, with Jeff, a camping trip for a clutch of kids. The girls prowled Feral’s greenhouse for tomatoes, and his fields for lettuce and carrots, and miniature Mexican cucumbers the size of grapes and that tasted for all the world like watermelons. His property fronts a fork of the Illinois, so when the heat got to us we marched down to the shore and shed our clothes and dove in, guarded by Pepper, his dog, and the ChiWeiner, who we were caring for in Stephanie’s absence. The ladies enjoy a dip in the pool, overseen by Pepper. We drank gloriously cold beer at night as the sun set and ate well and then talked until we were exhausted and flopped into bed. We realized that if we didn’t force ourselves to leave, we wouldn’t. And so on a Thursday morning, after loading up the truck and trying to find room for the ridiculous abundance that had been lavished upon us during the week (fresh eggs, pickles, canned peaches, cucumbers, garlic, mussels, pesto, chili sauces – the truck was a four wheel drive farmer’s market) we pointed our way down 199 back toward the coast, planning to spend some time camping amongst the redwoods. But it was a very difficult departure for all of us. Red beauty loaded up and sneaking a good-bye hug with Feral. First, that the sheer coincidence of meeting these folks on a cliff in Baja translated into a close friendship and an extraordinary invitation to participate in their lives was another of the many valuable, but wholly unexpected, aspects of our journey. Second, to spend time alongside all of these people who are so connected to the earth in a way that defines the contradictory combination of primitive instinct and sophisticated knowledge that is farming, was an incredible lesson. It felt to me at times as though some sort of fantastic window had been thrown open into this world, maybe a reminder to me of something that I knew to exist but had forgotten. The magic of seeds sprouting, of pulling your dinner from the earth or plucking it from a tree, or the unprovoked bounty of the oceans. Of life. We drove away, west to the coast and then south into the redwoods, their solemn, silent towers complementing my thoughts as I digested the time we had just spent so fully immersed in the simple business of a life won from the earth. Saying goodbye to all our friends was hard, certainly, but we know we’ll see them again soon.